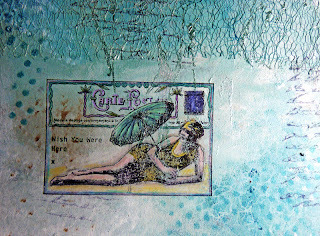 Today I am sharing another postcard for the September Crafty Individuals challenge - The last days of summer'. But first I just want to update you about my grandaughter (see last post). She is now back on a paediatric ward and making very good progress. Yesterday she had all her tubes taken out except a feeding one and she was able to go to the bathroom on her own. She also started to have something to eat, which all sounds very positive considering the surgery she had done and the number of hours she was under anaesthetic on Saturday. Thank you for all your good wishes and prayers, they are certainly working and we look forward to a speedy recovery so she can come home as soon as possible. 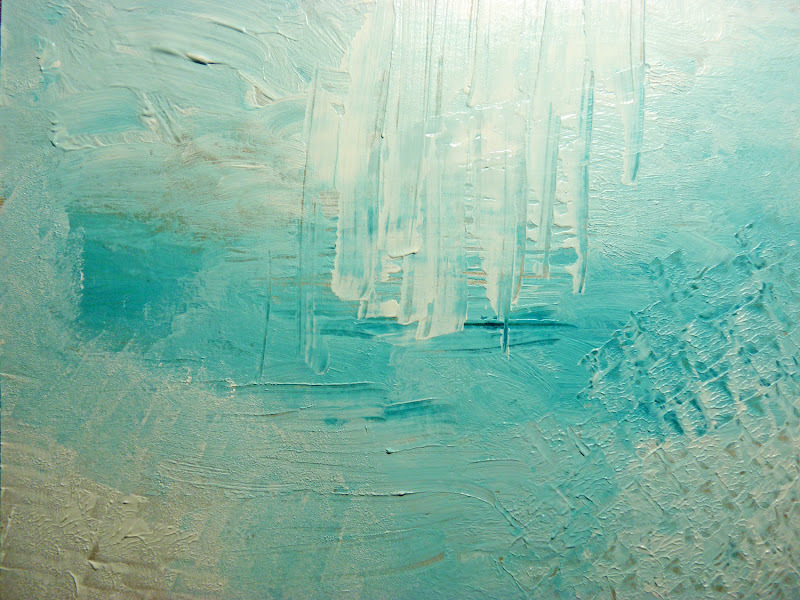 This piece is all about texture. 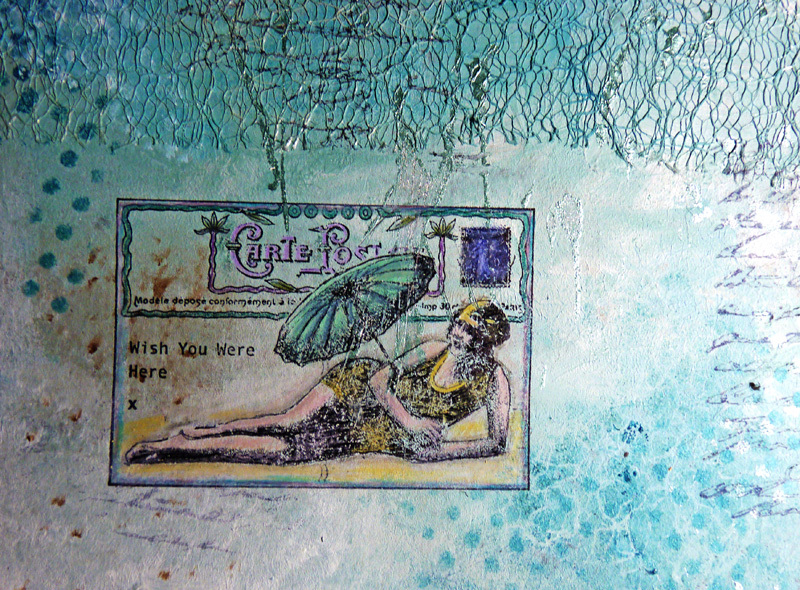 The background was made by applying different paints and some inks to a piece of card creating lots of texture by using different implements to lay it down. 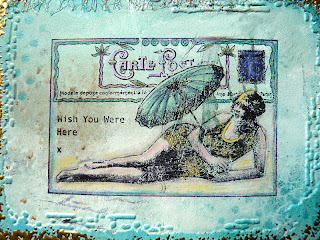 Once dry I stamped this beautiful CI 119 stamp of a vintage bathing belle with the message 'Wish you were here', it's the very last postcard you might pick up and send before the last of the summer days have gone. Once the image had been stamped over the dry backing, I coloured it using my brand new Prisma Colours that dear Terry bought me in Michaels when we went shopping in Valencia. Then I finished off by running it through the TH 'distressed frame' embossing folder , applying salty ocean and peacock feathers DIs and the Stampendous vintage gold enamelling powder. 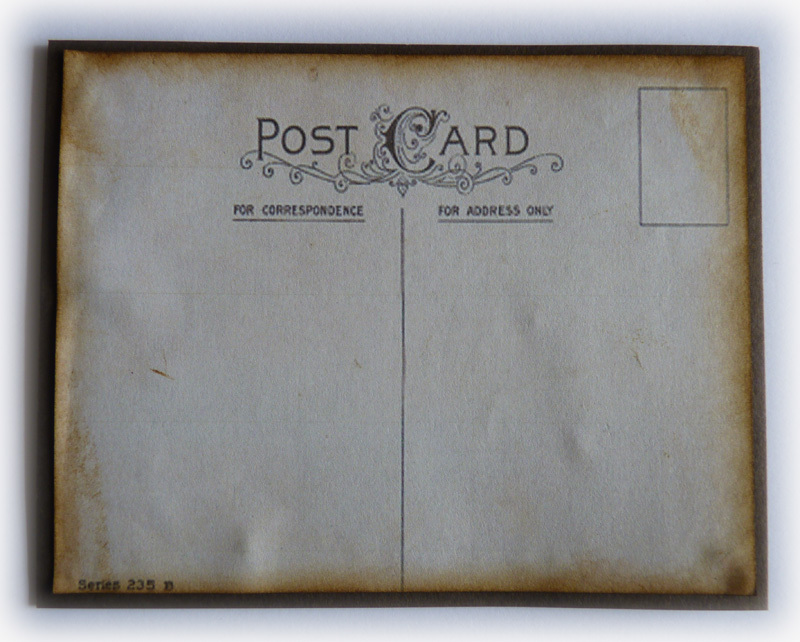 Finally I added an altered postcard backing, downloaded from the internet. I hope you enjoy the last days of summer, we were very lucky last week here in the UK with some glorious weather, but it's cooled off quite considerably now. So, pop on over to the Crafty Individuals blog to see the latest fabulous inspiration from the design team and perhaps join in with the theme. 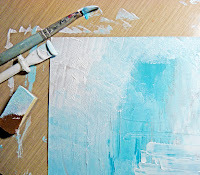 Wishing you happy crafting time. Hi Brenda...it is always so hard to watch our young ones suffer this pain...all the best for a good result and some relief. The card is gorgeous...that embossing folder is now on my wish list! Love this image, but more than anything ~ I love how you have showcase it. A truly superb job Brenda. Great news about your little granddaughter, Brenda - praying she continues to improve with every minute, bless her. Sorry, Brenda but I missed your last post. I am so glad though that your granddaughter has had her surgery now and that that part is all behind you now. Wishing her a very speedy recovery and love to you all. Young ones are very resilient and I hope she feels good again asap. Brenda I am so pleased on the news of your granddaughters progress and wish her well soon. She sounds as if she has been through a lot so far. That is such wonderful news. I cannot begin to imagine the distress for all of you seeing her with tubes, etc so thank goodness she is making this progress. Please keep us posted as to her recovery. 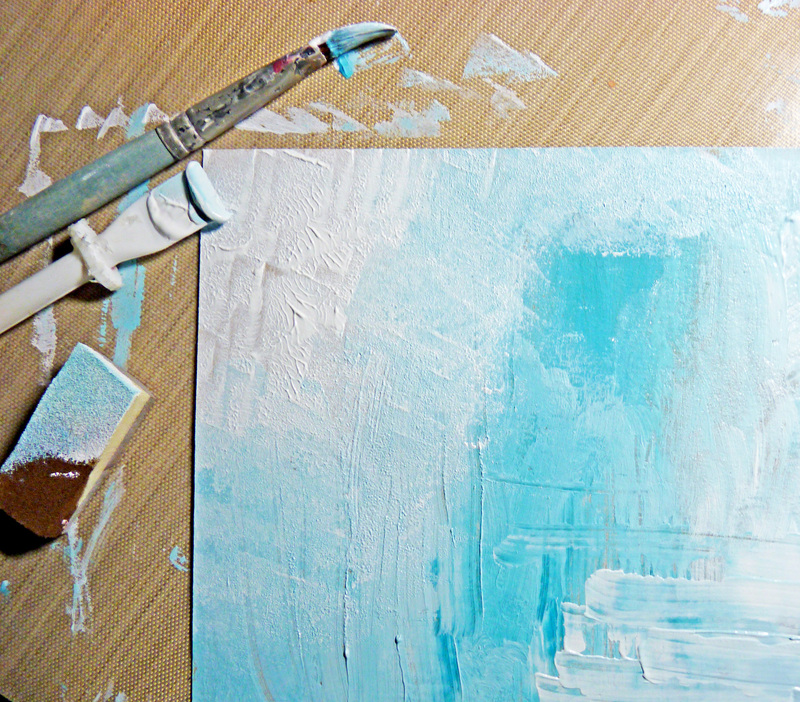 Fabulous texture achieved on your postcard with great colour choice. 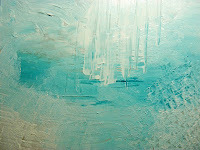 Love this project brenda ... you are so good at the 'old' texture bit .... Such good news about your little one!! May her recovery carry on quickly! Oh Brenda...what an awful time you are having. I sincerely hope your grand-daughter's condition improves. My sister was diagnosed with crohns in her early 20's, and apart from occasional stints on the steroids has managed without surgery. My sympathies to your friend in Canada, and to you for all your bad news this last week. Good news about your grandaughter! Your card is gorgeous, the colors are just perfect! Such terrific news on your grand-daughter you must be so thrilled. Good news that your grand daughter is on the mend, I hope things go well for her speedy recovery. Your postcard piece is a beauty. That's a wonderful image and your background is really stunning. OhhLaaLaa, the bathing beauty is gorgeous and I so love the gold edging! I am so happy to see you enjoying those Prisma pencils and not to mention, you really do them greatness! Hugs! Beautiful postcard. Love the colour with the gold embossing. Hi Brenda, Glad to hear your Grand daughter is improving, wish her well. 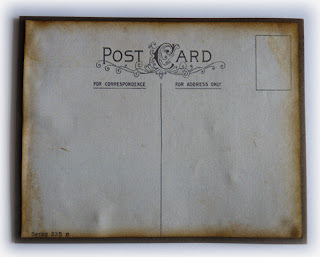 Gorgeous postcard, love all the texture, really gives shabby chic look. That's just completely gorgeous! And what great progress your granddaughter is making... keeping her in my thoughts and prayers for more good strides. 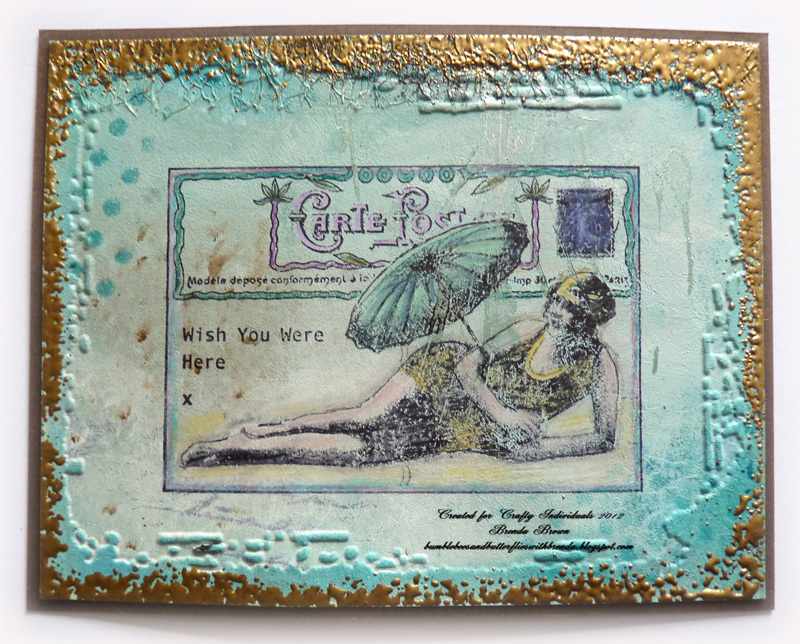 A really gorgeous creation Brenda and love the gold embossed edge which makes a great frame for the beautiful image. Thank you for the update on your dear grandgirlie, so glad to hear she is doing okay. Your card is gorgeous, Brenda.